Third party processing/Stacking services are used by companies who are unable to report directly (in-house); to the credit bureaus or businesses who want to use our easy credit reporting up-load services. 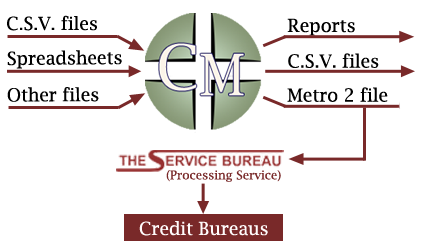 Obtain a Data Furnishers or Service Agreement & Subscriber code from each Credit Bureau (Equifax, Experian, Innovis, TransUnion) to which you will be using the third-party processing/stacking service. Meet the account reporting minimums for each bureau for processing/stacking services. All accounts must meet the standards defined in the Metro 2 Credit Reporting Resource Guide®*. Use Credit Manager for data accuracy which complies with the Metro 2 format standards and for easy uploads to our processing service. Please Note: Consumers (Individuals) reporting personal loans are not eligible to use this service. Our prompt credit reporting service, forwards accounts to the credit bureaus, Equifax, Experian, Innovis and TransUnion, on a weekly basis. This provides the quickest updates possible. The Service Bureau also provides extensive Metro 2® compliance checks with error reports and archives the accounts we forward for 12 months. * Three month, non-refundable deposit is required. Note: These charges apply to each batch of accounts, not each individual account. Processing fees are billed each time you upload a batch of accounts. Processing fees are applicable up to 1200 accounts or 2MB. We will accept a larger number of accounts for $8.00 per megabyte after the first 2MB. Note: Prices are subject to change and all services must be pre-paid. The credit bureaus (Equifax, Experian, Innovis, TransUnion) require monthly updates when reporting through a processor or direct reporting.